People tend to forget to eat salads and other raw foods in the cold weather. 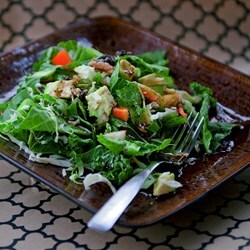 This salad is a good way to get your greens by combining somewhat heartier salad textures. I find that this salad is filling enough to be a main course, with a bit of bread or some rice cakes on the side. It will also work as an appetizer in a smaller serving. Mix collard greens, kale, romaine, cabbage, pear, onion, orange bell pepper, avocado, carrot, tomatoes, walnuts, and raisins together in a large bowl. Combine olive oil, vinegar, honey, oregano, chili powder, mustard, garlic, salt, and black pepper in a glass jar with a lid. Cover jar with lid and shake vigorously until dressing is well mixed. Pour dressing over salad; toss to coat.